Either get your fish monger to clean the sardines, or do it yourself by cutting a slit down the gut to remove the innards. Do it under running water, scraping away any scales that you can feel as well. Dry with paper towels and set aside. Place the kale and raisins in the hot water, squash down to quickly blanch then drain and rinse immediately under cold running water. Squeeze any water from the kale and raisins then place onto a chopping board. Add the pine nuts to the kale and raisins and chop roughly. Add the lemon zest, sea salt, pepper and garlic and keep chopping until everything is incorporated. Take the kale mixture and stuff each cavity of the sardines. Lay them on a greaseproof paper-lined baking tray and lightly season with sea salt and milled black pepper. Sprinkle over the panko and lightly drizzle with the olive oil. Bake in the oven for approximately 10 minutes, or until cooked through. While the sardines are baking, cut cheeks from the lemon and drizzle over a little oil on the cut side. Heat a non-stick pan over high heat, sear the cut side of the lemon until caramelised. 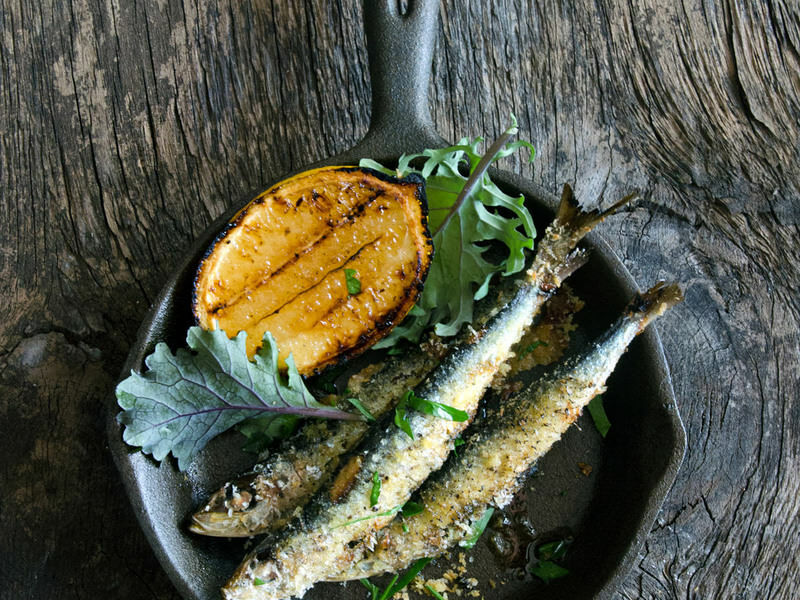 Serve the sardines as soon as they come out of the oven, drizzled with some caramelised lemon juice. Recipe generously contributed by http://heneedsfood.com.